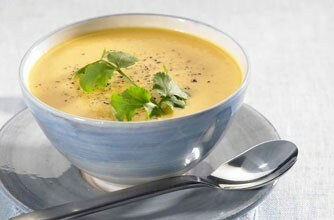 The days are colder, darker and longer and there is nothing better than a big bowl of nutritious tasty soup. This simple recipe makes the tastiest soup for the winter evenings! Of course, you could add some hearty homemade brown bread for a real treat! In large stock pot, saute the vegetables in olive oil for 15 minutes – stirring continually. Add the seasonings (salt, pepper and herb seasoning mix) and stir to mix well. Pour in the stock and bring to a boil, then reduce heat and simmer for 20 minutes or until the vegetables are tender. Remove from heat. Transfer the contents of the pot to another container and allow to cool for 15 to 20 minutes. Working in batches, place soup contents into a blender container and puree. Return the pureed mixture to the stock pot. Continue until everything has been pureed and returned to the stock pot. Check the taste and adjust seasoning to your taste. Place milk (or cream / water) and corn flour into a shaker container. Shake well. Slowly pour the milk / starch mixture into the reheating soup while stirring. Add the butter and continue to stir until thickened, butter has melted and soup is warm enough to eat. Garnish each bowl of soup with a few stalks of celery leaves. Give the recipe a go and post a picture of your finished product to our Facebook page – I’d love to see it!